Homer (whoever he was) has generally been considered the starting point for all of Western literature. His stories have been handed down for thousands of years, told and expanded and retold, to the point that the number of reimaginings rivals Shakespeare's. People have been reinterpreting Odysseus since Dante put him in the bowels of Hell for being a false advisor. Poets like Tennyson portrayed Odysseus as leaving Ithaca to embark on more journeys at the end of his life; twentieth century adaptations of the story include Joyce, the Coen Brothers, and Nikos Kazantzakis. So when a new book comes out that purports to be a retelling of the Homeric catalogue, one has to wonder what new material could possibly be added to over two thousand years worth of storytelling. 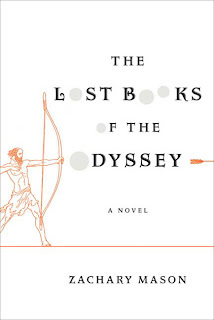 Surprisingly, however, Zachary Mason's The Lost Books of the Odyssey is a breath of fresh air. It might be presumptuous of me to declare this book as something completely new, as I'm sure that this sort of thing has been done before. But Mason takes his project and manages to create both something timeless, and a new conception of Odysseus that is very much part of the twenty-first century. The conceit of the novel is that the twenty-four books of The Odyssey are simply the twenty-four stories about Odysseus that happened to be written down. In a brief prologue, Mason discusses the idea that before the tale was committed to writing, there were an infinite number of Odysseys told by an infinite number of storytellers, and the idea was that these same few stock characters and images ("black ships drawn up on a white beach, a cannibal ogre guarding a cave mouth, a man searching a trackless sea for a home that forgot him") can be rewoven in countless ways. Mason himself provides forty-four "new" books of The Odyssey. This might sound like a corny creative writing project from a tenth-grader, and there was always the danger that The Lost Books of the Odyssey would have turned out that way. Mason, however, has taken his first novel and created something extraordinary. Instead of merely relying on his admittedly clever premise, Mason has taken each of the book's 44 chapters and made them something worth reading, something that is completely new to the reader while still hearkening back to the characters who are ingrained in our cultural heritage. Everybody knows the Odyssey and the Iliad. Even if you haven't read them, you're aware of the war outside the walls of Troy, the sailor Odysseus trekking across the stormy seas for a decade to get home, the seductive sirens beckoning his sailors, the faithful Penelope at home patiently awaiting her husband's return. Mason knows our culture's familiarity and relies on it. The forty-four books that he has written do not mesh together coherently - they are not a "new" Odyssey. Rather, he explores forgotten facets of the story, and narrative dead ends, what-ifs and what-might-have-beens and unconsidered possibilities. In one story, Odysseus meets himself and the two men have to try and outfox one another. In another, Odysseus comes home and sleeps with Penelope, but the book ends with the two lovers both staring up at the ceiling as they drift off to sleep, both aware that the other has been unfaithful, but too scared to bring up the fact. There are books where Odysseus makes it home safe and sound, books where he wanders the earth for eternity, books where he dies outside the walls of Troy before his journey home even begins. Odysseus, like Homer's version of the character, is constantly portrayed as a trickster and a clever man, but there are countless facets of this one stock character trait that Mason explores. Additionally, Odysseus is not the only character that receives new life - evil Circe, the id-driven Cyclops, brash Achilles, stubborn Agamemnon - all of these characters are developed and rediscovered numerous times. One story retells the Trojan War with Paris as Death, bringing violence and chaos to Earth. Another, one of my favorites, tells of Agamemnon as a foolish ruler desperately seeking wisdom, and asking Odysseus to scour the world far and wide to sum up all of human knowledge in a single word. But perhaps the best chapter in the entire book portrays a very different retelling of the Trojan War, with Odysseus as a headstrong soldier who goes against the advice of his Greek comrades. After the fall of Troy, he disguises himself as a storyteller, and travels the land recreating his own version of what happened at Troy. The tales that Odysseus invent paint himself as the hero, and eventually become what we know as The Odyssey today. It's a very simple story - all the "new" books are. But Mason paints it with such elegant language that it feels right at home next to the Homeric tales we have grown up with. This version of Odysseus, the storyteller stroking his own ego, ties all the other books together and makes the reader think about what tales are passed down and why. And that's the best part about The Lost Books of the Odyssey. The reader is forced to consider Homer's legacy. Why do these tales have such dramatic power? Why do we return to them? Why do they still speak to us thousands of years later? Is there really just one story, Joseph Campbell-style, with countless retellings and reimaginings? Does the tale speak to some primal narrative impulse within us? Or is the Odyssey a fluke, an accident of history that just has happened to be preserved through chance? I don't want to make the case that The Lost Books of the Odyssey is some new masterpiece that will be read for the next two thousand years. Some of the stories fall flat, and the episodic nature of the book gets tiresome by the end, as the "new" books rarely last longer than a couple of pages. But if you feel compelled to revisit the windswept Aegean Sea and re-embark on a new journey with Odysseus, why not choose to make it a different kind of trek? This novel could have been a pretentious failure that appeals only to classicists, or it could have read like juvenile Homeric fan fiction. But instead, Mason has achieved what some of the best writers of the past millennia have managed to do - he has taken a timeless story, and put his own signature onto it, recrafting the piece in his own image without losing sight of what made the original so great. That alone is worth a read, I think.